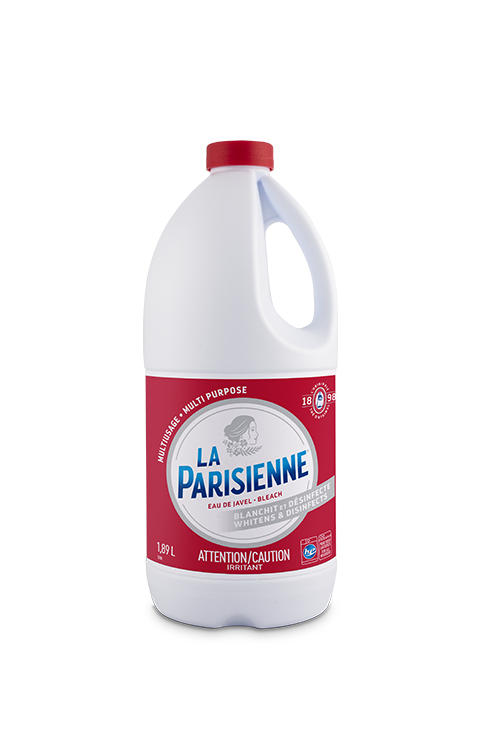 La Parisienne Multi Purpose Bleach is an economical disinfectant and can be used as a laundry whitener. Can be used to whiten tile grout and disinfect hard surfaces (e.g., counters, garbage cans, cutting boards, litter boxes, basins). Remember to use the recommended amounts and times on the label for disinfecting. Pour bleach into dispenser (HE washer) or into washing water (regular washer) before adding laundry. Never pour directly on fabrics. Cotton diapers: let soak for 10 minutes in a solution of 40 ml of La Parisienne bleach and 4 L of water. Rinse well to prevent baby’s skin from developing redness and irritation. Test product on a hidden part of the article before use.